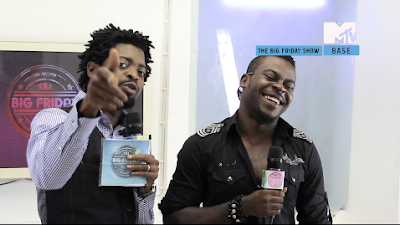 On episode 4 of Glo presents The Big Friday show, our studio guest is the well known musician SHANK. We also have our usual Glo presents The Friday Show Vlog segment brought to you by our hot Vlogger Stephanie who gives us the hottest news in the entertainment world. We have on the show this week an upcoming artist, DIZZY who will be given a task/studio challenge to complete in order to promote himself at the end of the show. There is also the CELEB SURPRISE segment where a lucky glo subscriber was pleasantly surprised by the amazing multi-talented Actor and Director, DESMOND ELLIOT. The other segments in this week’s show includes the ASK/REPLY where Glo subscribers text in questions and MEET ME where a lucky Glo subscriber gets to meet Shank and ask him questions. Don’t forget our weekly Glo presents Big Friday Show Countdown and the hilarious WHAT WERE THEY THINKING? This episode was shot at Deuces in Victoria Island Lagos and is hosted by our funny host BASKETMOUTH.